I made this recipe for the bobo Cybercook. I added red bell pepper, I removed the skin and seeds of tomatoes and not used to puree the tomatoes on the original recipe, also decreases the amount of palm oil. Funny, I make this dish often, but still had not posted. Cassava is from my backyard that I have planted a few feet and whenever I need a hole and get the piece that I use. 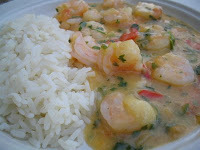 Place the cassava into a pot, cover with water and bring to a simmer for about 30 minutes, until soft. Then, drain and blend in a food processor with the coconut milk and milk until a smooth paste. Reserve. Heat palm oil in a pan, saute the onion for 3 min. Add garlic, tomatoes, peppers and cook for about 8 minutes. Add the parsley and chives, season with salt. Place the mashed cassava and cook stirring constantly until mixture is warm. Add the shrimp and wait until they are completely cooked (do not overcook or they will be stiff). Taste and add more salt if needed. In the end, add the cilantro. Remove from heat and serve with cooked rice.